The common name comes from the "pinked" or toothed edges to the petals not from the flower colour which is often, but not always pink! 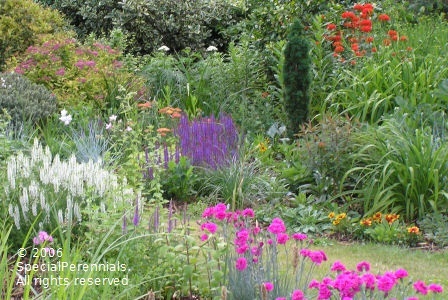 They love well-drained soil and full sun. They grow best in limy soils but do well in neutral and mildly acid soils. They will not grow in very acid (e.g. peat) soils. The modern varieties flower from late May to September and we have selected varieties with really good perfume. Drought tolerant. Perfect Partners: In the foreground of the picture to the right " Devon Wizard glows magenta. It is cooled and accentuated by the Salvias "Schneehügel" (white) and "East Friesland" (deep blue). In the background the blazing red of Lychnis chalcedonica clashes "Christopher Lloyd-like" with the Dianthus! Propagation is from cuttings - pull off a "pipe" - a section of unflowered stem around 4" long - and remove the lower pairs of leaves. Push into very gritty compost, or even a mix of sand and soil water and keep in a warm place - not in full sun. Most root and can be potted on once starting to grow again. NB all our plants have European Plant Varietal Rights so it would be illegal to sell any plants you propagate yourself. Members of the Caryophyllaceae family. Pure white flowers and a really lovely scent. 1ft tall and bushy. Strong magenta flowers, bushy plants and scent that fills the garden on a warm day. The best of border the pinks.